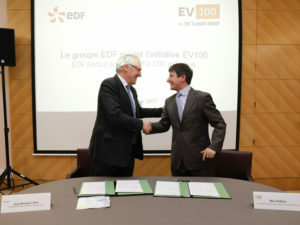 French utility EDF Group has become the latest multinational to join the EV100 initiative as it commits to switching to its entire care fleet to electric vehicles by 2030. Signing up to the initiative – which was formed this autumn by non-profit organisation The Climate Group and aims to fast-track EV uptake – the group said it will transition its fleets to electric vehicles, starting in France, followed by fleets belonging to its subsidiaries. Other plans include installing solar photovoltaics at its nuclear plants in France, making use of its own ‘smart plug’ smart charging terminals, and deploying autonomous electric shuttle vehicles. The group is also working on helping its customers to use electric vehicles by developing a charging infrastructure nationwide. Announced as governments meet today in Paris for the One Planet Summit – two years to the day since the Paris Agreement was signed – the firm said its ‘Goal 2030’ pledge will enable it to “go beyond the requirements of the two degrees Celsius trajectory set by COP21”. Other global firms that have signed up to the EV100 initiative include LeasePlan, Ikea and Deutsche Post DHL Group, which have pledged to migrate their fleets and infrastructure over to electric vehicles by 2030 under the initiative. And Japanese office supplies e-commerce company Askul Corporation has now committed to switching 200 vehicles to EVs by 2030.